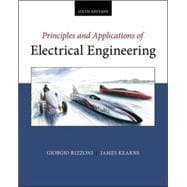 Giorgio Rizzoni and James Kearns 6th edition provides a solid overview of the electrical engineering discipline that is especially geared toward the many non-electrical engineering students who take this course. The hallmark feature of the text is its liberal use of practical applications to illustrate important principles. The applications come from every field of engineering and feature exciting technologies such as Ohio State’s world-record setting electric car. The appeal to non-EE’s is further heightened by such special features as the book’s Focus on Measurement sections, Focus on Methodology sections, and Make the Connection sidebars. McGraw-Hill is also proud to offer Connect with the sixth edition of Rizzoni and Kearns, Principles and Applications of Electrical Engineering. Connect is the only integrated learning system that empowers students by continuously adapting to deliver precisely what they need, when they need it, how they need it, so that your class time is more engaging and effective. Rizzoni and Kearns Principles and Applications of Electrical Engineering, sixth edition, includes the power of McGraw-Hill’s LearnSmart--a proven adaptive learning program that helps students learn faster, study more efficiently, and retain more knowledge for greater success. LearnSmart is included in ConnectPlus.